Learning the facts about anger can help you control your emotions to where you do not display angry outbursts, or worse yet, hold all the emotions in and ignore them. 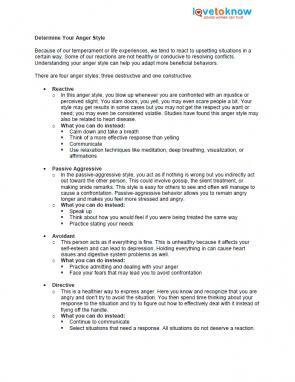 Use these five worksheets to help you better understand anger and how to deal with this emotion. Anger is an emotion that everyone feels at some point. Whenever you're frustrated with something or someone, anger may be a way to show that frustration. Unfortunately, not everyone knows how to control his or her emotions, which can lead to physical violence or other equally destructive behavior. In order to understand what anger is and how to manage it, it is important to understand the various aspects of this emotion. What happens to your body when you get angry? Your musculoskeletal, cardiovascular, and gastrointestinal systems all get involved. You may develop headaches, clench your jaw, your stomach may hurt, and your heart rate and blood pressure may increase. 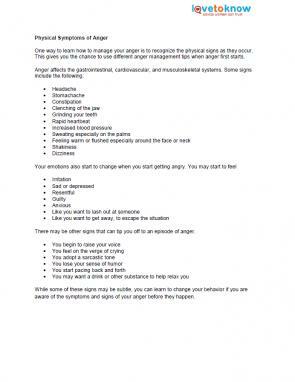 You can use this worksheet to help you recognize the physical signs of anger in yourself and others. Understanding how a body reacts to anger can help individuals manage a potentially hostile reaction. Once you understand the bodily signs of anger, you can use different techniques to manage your emotions in the moment. There are several relaxation techniques that can help people head off feelings of anger and stress before things get out of control. 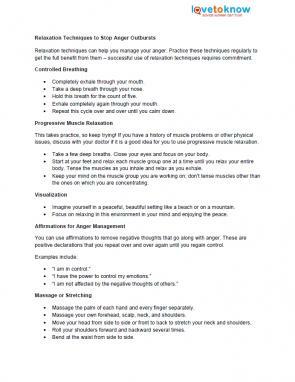 These include slow breathing, repeating a calming word or phrase, positive imagery and progressive muscle relaxation exercises. 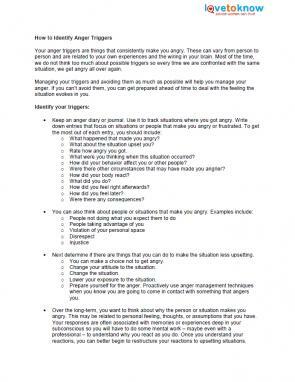 This worksheet can give you tips on how to deal with feelings of anger while you are actively anger. Although it is important to manage your anger as it happens, you can also learn to manager your anger over the long term. This requires that you think about how and why you get angry and what types of people or things get under your skin. One step in managing your anger is to figure out your anger style. You can have a reactive, passive aggressive, or avoidant style which can lead to destructive behaviors and reactions. People who have a directive anger style tend to manage their emotions better and have better control of their relationships. Use this fact sheet to help determine how you typically react when you are angry and find some ways to better channel your emotions. Another way to manage your anger is to identify your anger triggers -- what makes you angry. This may take some time and reflection. However, when you find certain situations or people who routinely upset you, take steps to either lower your exposure to these factors in the future or to better prepare yourself for the encounter. Another way to better manage your anger is to make adjustments in your life that may improve your mood and help you deal better with unpleasant situations -- both expected and unexpected. For example, exercise, prayer, and therapy may put you in a place where things that may have made you angry in the past don't have the same effect on you moving forward. Working through these worksheets can help you recognize things that affect you in ways that make you angry and how you can make changes in the future to avoid destructive outbursts. Never getting angry again is unlikely, but you may be able to get a better handle on your feelings. 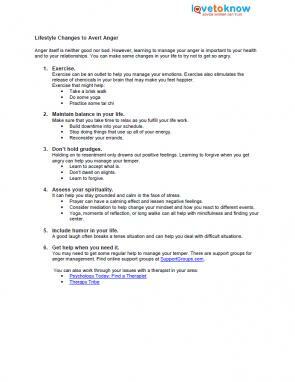 These worksheets may not be enough for everyone; in some instances, you may have issues that you cannot control alone. Anger management classes, support groups, or a therapist who can work with you on managing your anger may be necessary as well. Anger can be challenging to deal with, but learning the basics can help anyone begin to control their outbursts more effectively.